Prominent & Leading Manufacturer from New Delhi, we offer light duty storage racks, slotted angle storage racks, heavy duty slotted angle racks, slotted angle racks and multipurpose slotted angle rack. 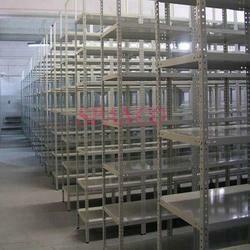 We at Spanco are the leading manufacturer & supplier of Light Duty Storage Racks. 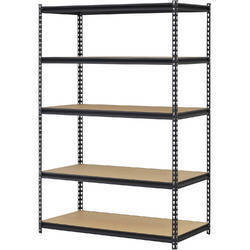 Our racks are ordered in bulk assortments by various departmental stores and shops. 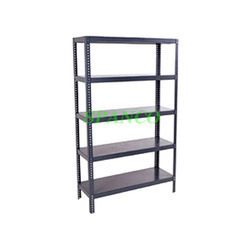 These racks are provided at the customers' stipulated place within the set time frame. 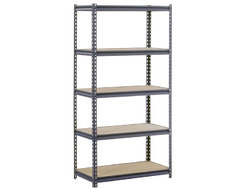 Spanco Slotted Angle Storage Racks helps you build an efficient framing system for a variety of uses .Our slotted angle storage racks are the most versatile, time and cost effective construction material available for various applications. Moreover, client can get the provided products from us at very economical prices. We manufacture the Heavy duty slotted angle racks, angle racks and slotted angle racks in a variety of designs and dimensions. They are made through advanced technical processes and are made using CR, mild and HR steel. They are durable, robust in construction and they use space in an economical manner. 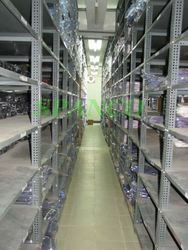 They are widely used in storage units, lofts, go downs and basements in industrial sites. They are made in accordance with customer requirements and we offer them at competitive prices. 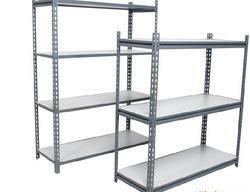 We fabricate the Indian Slotted Angle Racks in various dimensions and designs and sizes. They are made through highly sophisticated engineering processes and are made using mild, HR and CR steel. They are long lived, robust and hardy in construction and they are economical in space utilization. They are widely used in showrooms, go downs, storage units, lofts in industrial sites and factories. They are made according to customer specifications and we offer them at affordable prices.We are also known as Slotted angle racks manufacturers. Our company has established itself as a leading name of superior quality Multipurpose Slotted Angle Rack in the market at the present scenario. These are made available to the customers at industry leading rates and are provided as per the set industry norms and protocols as well. These are designed to fit easily in the corners and can withstand huge loads. We understand that an impressive display plays a very important role in the world of buying and selling. These are easily divided in proper sections and divisions. For more than 2 decades, we are catering to multiple storage requirements to major clients spread across different places. We offer the best quality Slotted Angle storage system that is reckoned for its sturdiness, robust structure & accurate dimensions.We are the leading Slotted Angle Racks Supplier in Delhi.